“I don’t like the idea of a police state, but that’s where we seem to be heading,” he says. 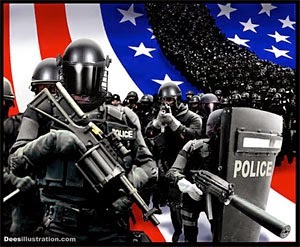 My only disagreement with Chief Thompson would be that we are not heading towards being a police state, as the videos below clearly show, we are already there. YouTube is full of videos showing this police state mentality, I wrote about this just the other day where a Nazi-like cop was busted lying on her “officer narrative,” after multiple footage captured by the family she abused became public. Another example can be seen with the recent total FAIL of the NYP in their Twitter campaign #myNYPD which was meant to show how much NY citizens loved their police force, but which backfired spectacularly when user after user started posting images, videos and statements about NYPD’s police brutality, as discussed in the first video below at the 1:20 minute mark. For the record, I believe wholeheartedly there are many, many more good cops vs bad cops, to put it simply, but these examples shown below make it harder for those “good guys,” because the brutality and abuse by the bad cops endanger the lives of those that truly did join to serve and protect.